Materials: White painted metal (iron). White painted brass. Counterweight inside. Some metal parts. White plastic socket. 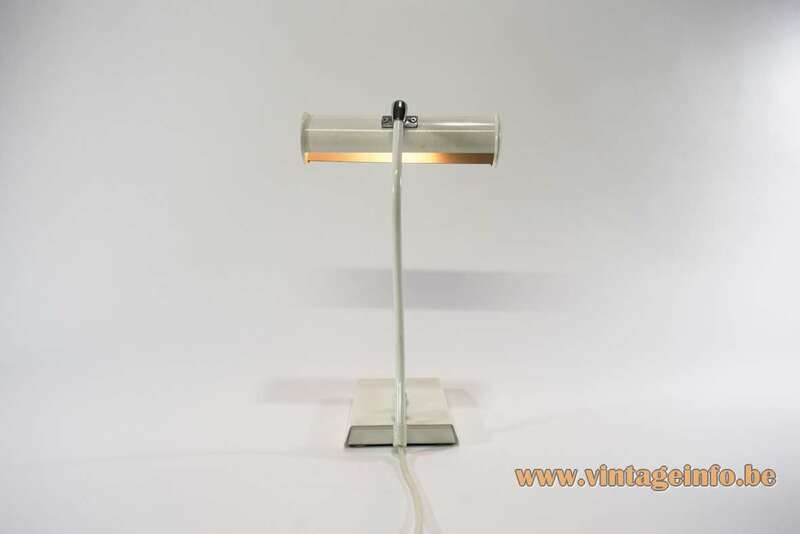 Manufacturer: ANVIA: Algemeene Nederlandsche Verlichtingsindustrie Almelo. General Dutch Lighting Industry Almelo, The Netherlands. Other Versions: In all probability made in several colours. 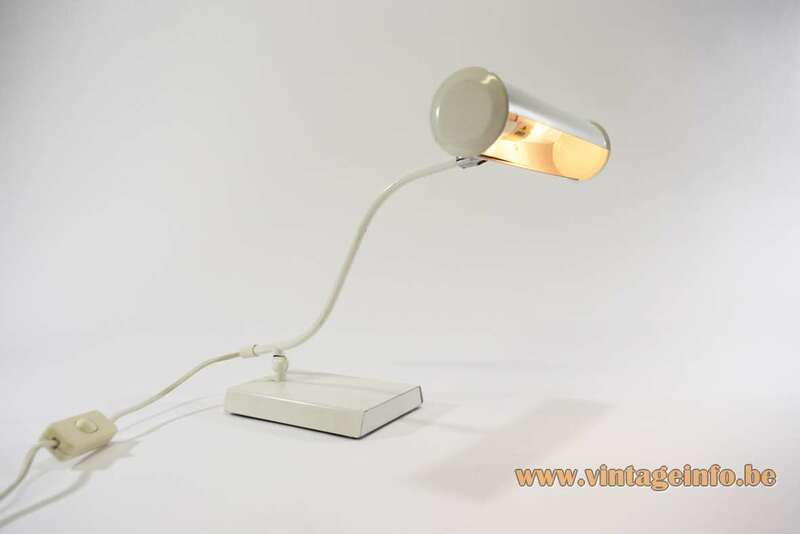 This lamp has everything to be a picture light, but it has no wall connection. The label is glued on the socket. 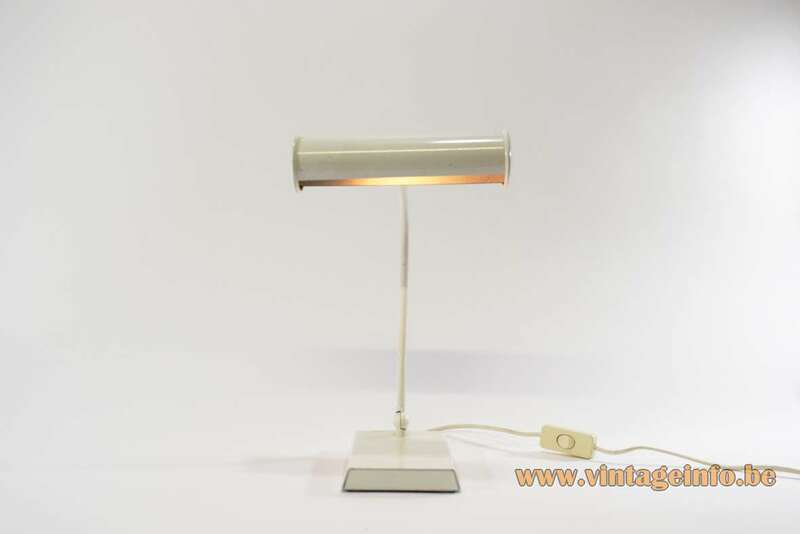 Almost similar lamps were produced by HECA, a Dutch company from Edam. 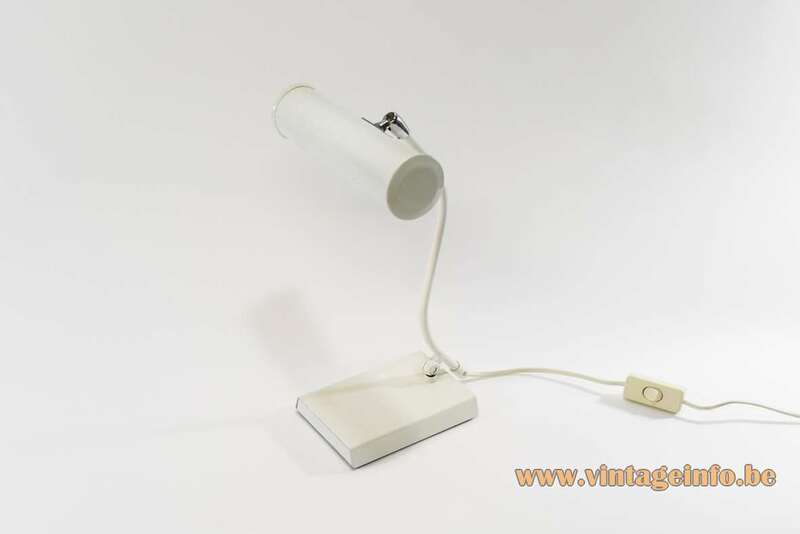 The company produced many similar lamps. 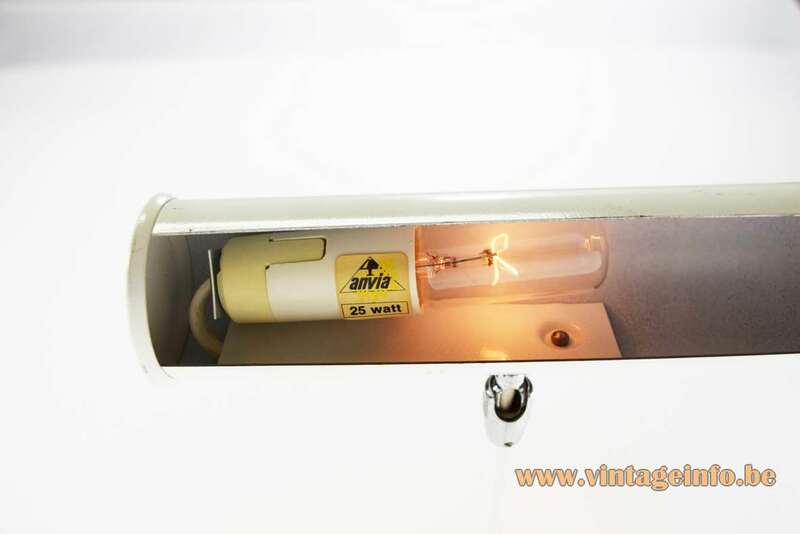 ANVIA was a brand that made high quality modern lamps. In 1933 the brand was first registered in the Netherlands, but was from origin a German company. The story of ANVIA begins in 1909 when it was founded by the Jewish Max Liebert, who ran the company together with his wife Käte and son Werner in Berlin, Germany. They also had a daughter named Ilse. By 1930 the company is doing so well, that they have factory’s in 3 different locations. But in 1933 Hitler takes charge of Germany, and almost everything gets taken away. Max Liebert gets the change to re-locate one of his factory’s. So they move the factory to Almelo in the Netherlands. The factory is doing great. Evidence of the growing number of employments and personnel trips to ‘Shiphol’ confirm this. But in 1940 the Netherlands get taken over. And in March 1942 Max and his wife are being forced to give up their company. In May 1943 Max and his wife get taken to Westerbork. To be deported to Vernichtungslager” Sobibor a couple of months later. Were they were killed after 3 days on the 21th of may 1943. Son Werner also gets killed. Location of death ‘Auschwitz, september 13 in 1943’. Daughter Ilse Kaufmann-Liebert is the only one to survive, and when the war is over, Ilse and her husbant Fritz Kaufmann start rebuilding the factory on request of the workers. In 1952 not only the company is growing fast, but also Ilse and Fritz their familly is. They have 3 children at this point. Fritz dies in 1952 and Ilse is on her own to lead the company. A time of external directors encounters. Later in the 1950’s Ilse meets Industrial designer JJM Hoogervorst from Haarlem on the year exhibition in Utrecht. This is when the glorious days of Anvia begin. They are the 1950s and 60s. The designs of JJM Hoogervorst gets Anvia to an international level of fame. In the early 1980s Ilse retires, and ANVIA gets sold to a window blinds company, and the name and products disappear. Untill a couple of years ago Michel Klein from the Netherlands brings the brand back to life. 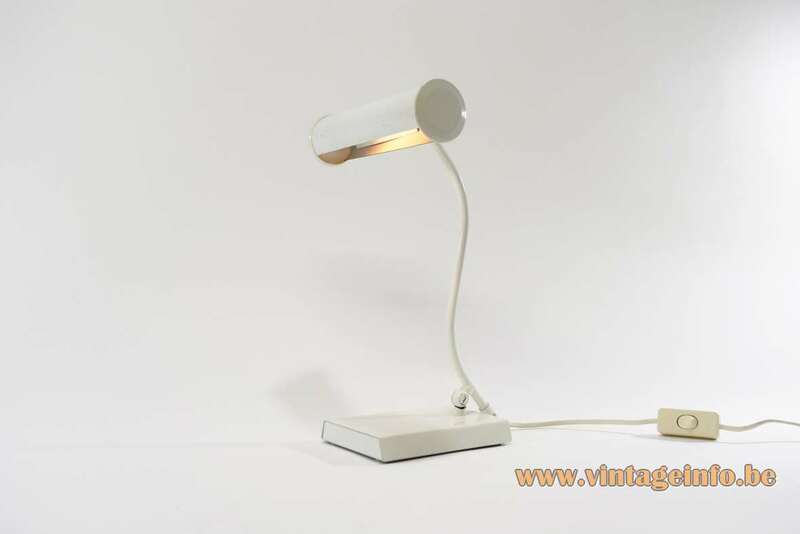 They are now making high quality lighting again, complementing the fine mid century design pieces created by JJM Hoogervorst. Ilse, her children, and Hoogervorst his son, all added their piece to the story, the ANVIA history.